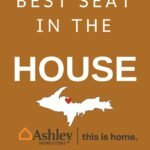 Locally-owned Ashley HomeStore is a proud supporter of Marquette Sports and they want to show their appreciation for Marquette Fans by giving away “The Best Seat in the House”! Dramatically transform your game-day living space with the rustic look of weathered leather that you love and the get comfort that you need for afternoons in front of the big screen. 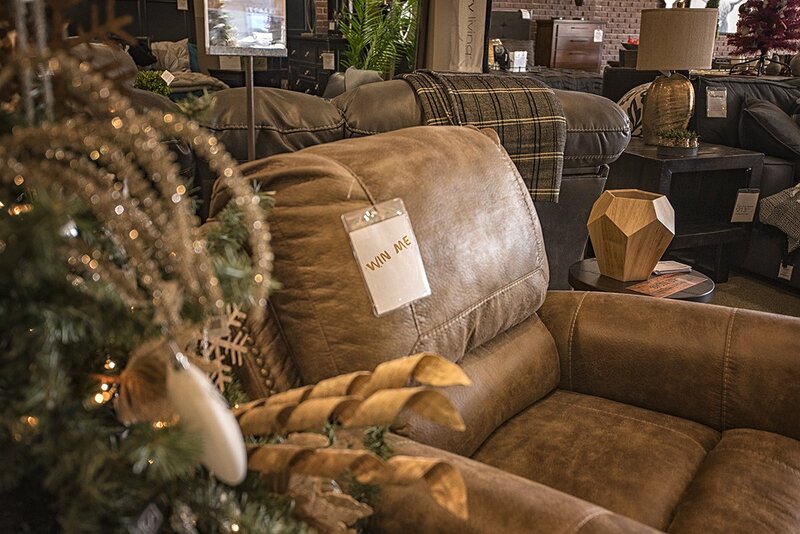 One lucky winner will get to put this Larkinhurst faux leather rocker recliner in their house when they win at the end of Marquette winter sports season! 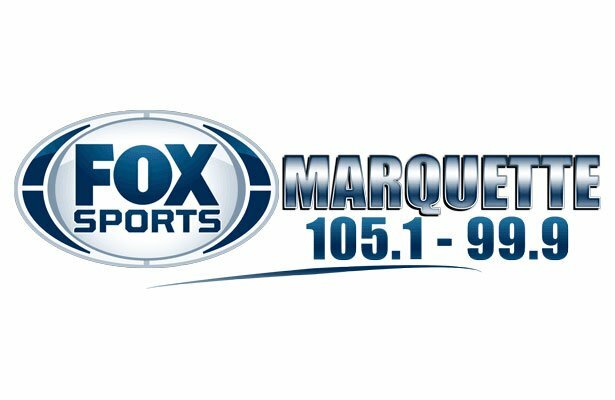 Teaming up with Fox Sports Marquette, home of the Marquette Redmen and Redettes, we will announce the winner of the contest with Ashley HomeStore on air at the end of the sports season. 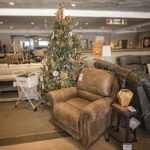 To register to win this $760 recliner you must stop in to the beautiful Ashley HomeStore two-floor showroom in Marquette. The family-owned furniture store is located at 2152 US-41 West in Marquette, Michigan. 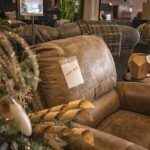 You can see and even test out the recliner right there in the store before filling out a slip to put yourself in the running for a chance to win! 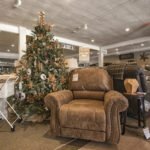 You must register by Monday, December 31st, 2018 in order to qualify for a chance to win the Larkinhurst recliner. NO PURCHASE NECESSARY TO ENTER OR WIN A PRIZE IN THIS CONTEST. A PURCHASE WILL NOT INCREASE YOUR CHANCES OF WINNING. VOID WHERE PROHIBITED. IN ALL CASES, WHERE THE SPECIFIC RULES OF A CONTEST DO NOT SPECIFICALLY OVERRIDE THESE GENERAL RULES, THE GENERAL RULES APPLY. ELIGIBILTY: All entrants must be legal residents of one of the fifty (50) United States or D.C. and 18 years of age or older. Corporate entities are not eligible and have no right to claim any prize won by their employees. Employees and family members of employees (or people living in the same household) of Great Lakes Radio, Inc. are not eligible. For the purposes of this Great Lakes Radio, Inc. contests, family members are defined as husband, wife, mother, father, mother-in-law, father-in-law, grandmother, grandfather, brother, sister, children and grandchildren. Participation in any Great Lakes Radio, Inc. contest, including any contest run by a station owned by Great Lakes Radio, Inc. constitutes entrant’s full and unconditional agreement to and acceptance of these official rules and the decisions of Great Lakes Radio, Inc.
HOW TO ENTER: To enter, go to any contest entry location, including websites, during the contest period and completely fill out and submit the entry form for this contest. One entry per person per day will be allowed. Entries submitted or received after the contest period will be void. RANDOM DRAWING: Prizewinners will be selected in a random selection method to be conducted by Great Lakes Radio, Inc. and/or its designated judges, whose decisions are final. Winners will be notified by telephone and/or e-mail and/or in person as determined by Great Lakes Radio, Inc. after the random selection. Odds of winning a prize depend on the number of eligible entries received. Limit one (1) prize per person. Winners are solely responsible for all federal, state and local taxes applicable to prizes won. All expenses not specified herein are the sole responsibility of the winners. No cash substitutions, transfer or assignment of prize will be allowed, except at Great Lakes Radio, Inc.’s sole discretion. If any prize or portion thereof is unavailable, Great Lakes Radio, Inc. has the right to replace that prize or any portion thereof with a substitute prize of equal or greater value. If legitimately claimed, all prizes will be awarded. GENERAL: All entrants acknowledge that if they are chosen as a winner, certain of their personally identifying information may be disclosed to third parties at least as required by law, including, and without limitation to, a winners list. In addition, except where prohibited by law, by entering, each entrant consents to the use of his/her name, picture, image, likeness, voice, biographical data, and any other information contained in his/her entry by Great Lakes Radio, Inc. and the Great Lakes Radio, Inc. affiliates for any use whatsoever, including, and without limitation to, advertising, promotional, and marketing materials in any medium whatsoever (including, without limitation, the internet) without additional compensation, notice, review, or approval. Entries become Great Lakes Radio, Inc. property and will not be returned. Winners may be required to sign and return an Affidavit of Eligibility and Liability/Publicity Release (where legal) within the timeframe specified by Great Lakes Radio, Inc. to receive a prize. If tentative prizewinners cannot be reached within a reasonable time (as determined by Great Lakes Radio, Inc.) from the date of first notification attempt, such person may be disqualified and an alternate entry may be randomly drawn. Return of any prize notification/prize as undeliverable or as rejected may result in disqualification and the awarding of the prize to an alternate winner. In the event of a dispute regarding the identity of an online entrant, the entry will be deemed submitted by the authorized account holder of the e-mail address provided, but only if that person meets all other eligibility criteria. An authorized account holder is defined as the natural person who is assigned to an e-mail address by an internet access provider, online service provider, or other organization that is responsible for assigning e-mail addresses for the domain name associated with the submitted e-mail address. It is the responsibility of entrants and winners to prove, solely at their own cost, to Great Lakes Radio, Inc. their identities and that they have not broken any rules. By entering, entrants agree to be bound by these official rules and that they will not knowingly damage or cause interruption to the contest or prevent others from participating in the contest. Any person who supplies false information, obtains entries by fraudulent means, or is otherwise determined to be in violation of these official rules will forfeit any prize won and may be prosecuted to the fullest extent of the law. Any attempt to deliberately damage any web site or undermine the legitimate operation of the contest is a violation of criminal or civil laws and should such an attempt be made, Great Lakes Radio, Inc. reserves the right to seek damages or other remedies from any such person(s) responsible for any such attempt to the fullest extent permitted by law. This contest is governed by U.S. law and is subject to all applicable federal, state and local laws. Participants agree that any and all legal actions or claims arising in connection with this contest must be brought in a court of competent jurisdiction within the U.S. Neither Great Lakes Radio, Inc. nor the Great Lakes Radio, Inc. affiliates are responsible for: incomplete, lost, late, damaged, illegible, mutilated, postage-due, or misdirected e-mail/mail; technical, hardware or software failures of any kind; lost or unavailable network connections; any infection by computer virus or bugs while participating in the Contest; failed, incomplete, garbled or delayed computer transmissions; or errors, typos, or misprints in these official rules or in any Contest-related advertisements or other materials, whether caused by Great Lakes Radio, Inc. , the entrant, or by any human error. Great Lakes Radio, Inc. is not responsible, and may disqualify you, if your e-mail address does not work or if it is changed without prior written notice Great Lakes Radio, Inc. . Great Lakes Radio, Inc. reserves the right, in its sole discretion, to void entries of any entrants who Great Lakes Radio, Inc. believes have attempted to tamper with or impair the administration, security, fairness or proper play of this Contest. Great Lakes Radio, Inc. reserves the right to cancel, suspend, or modify the Contest if it is not capable of running as planned for any reason whatsoever. In such event, Great Lakes Radio, Inc. may, in its sole discretion, perform the random drawing from among all eligible entries received prior to or after such cancellation, suspension, or modification. WINNERS, BY ACCEPTANCE OF A PRIZE, AGREE TO RELEASE, INDEMNIFY, DEFEND, AND HOLD HARMLESS GREAT LAKES RADIO, INC., ITS EMPLOYEES AND AGENTS, CONTEST SPONSORS, AND THE GREAT LAKES RADIO, INC. AFFILIATES FROM ANY AND ALL LIABILITY, CLAIMS OR ACTIONS OF ANY KIND WHATSOEVER RELATED TO THIS CONTEST, THE AWARDING OR USE OF ANY PRIZE AWARDED IN THIS CONTEST, AND FOR INJURIES, DEATH, OR DISABILITY, AS WELL AS DAMAGES OR LOSSES TO PERSONS OR PROPERTY, INCLUDING, WITHOUT LIMITATION, IN CONNECTION WITH TRAVEL TO OR FROM ANY CONTEST RELATED-ACTIVITY. NEITHER GREAT LAKES RADIO, INC. NOR THE GREAT LAKES RADIO, INC. AFFILIATES MAKE ANY WARRANTY, REPRESENTATION, OR GUARANTEE, EXPRESS OR IMPLIED, IN FACT OR IN LAW, WHETHER NOW KNOWN OR HEREAFTER ENACTED, RELATIVE TO ANY PRIZE, INCLUDING, WITHOUT LIMITATION, QUALITY, MERCHANTABILITY, AND/OR FITNESS FOR A PARTICULAR PURPOSE. One entry per person. One winner per household. Void where prohibited by law. Listeners may only win or qualify to win once every thirty (30) days. 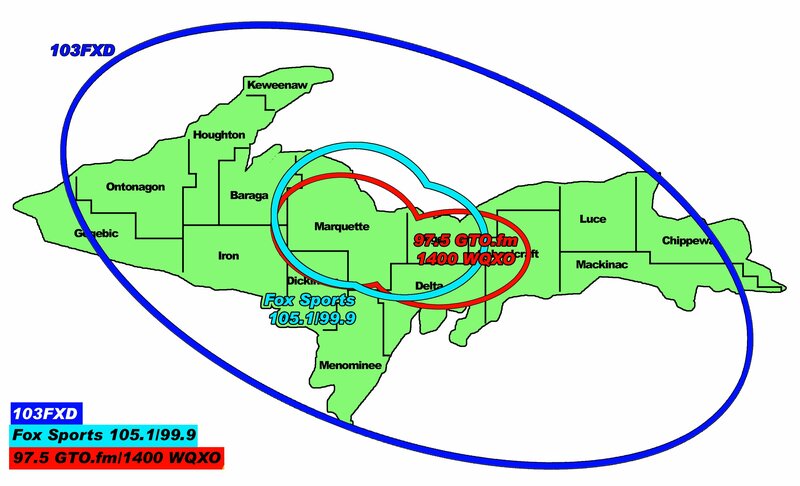 Great Lakes Radio, Inc. reserves the right to extend the thirty (30) day rule to the length of any specific contest. Great Lakes Radio, Inc. reserves the right to cancel, terminate or modify the contest if it is not capable of completion as planned for any reason, including, but not limited to, infection by computer virus, bugs, tampering, unauthorized intervention or technical failures of any kind. The decision of the Great Lakes Radio, Inc. is final. All federal, state and local laws and regulations apply. Great Lakes Radio, Inc. and it licensed affiliate stations, their subsidiaries and affiliates, their officers, directors, agents, stockholders, insurers, and employees, and their advertising and promotional agencies and sponsors assume no responsibility or liability whatsoever for damages, loss or injury resulting from participating in any contest or acceptance or use of any prize. In consideration of participation in a contest, and for other good and valuable consideration, the receipt and sufficiency of which are hereby acknowledged, the Entrant, on Entrant’s behalf, and on behalf of Entrant’s heirs, successors or assigns, administrators and personal representatives, does hereby COVENANT NOT TO SUE, FULLY RELEASE AND FOREVER DISCHARGE Great Lakes Radio, Inc. and it licensed stations and each of their respective direct and indirect subsidiaries, affiliates, partners and related entities, each of their respective directors, officers, employees, agents, insurers, attorneys, shareholders and representatives, and each predecessor, successor, and assign thereof, from and against any and all actions, charges, claims, losses, costs, damages, expenses (including attorneys’ fees and expenses) and liabilities of any kind or character, whether known or unknown, in connection with, arising out of or in any way related to Entrant’s participation in any contest. By participating in the Contest or by claiming the prize, the participants and/or winners authorizes the use, without additional compensation of his or her name and/or likeness and/or voice/photograph for promotion and/or advertising purposes in any manner and in any medium (including without limitation, radio broadcasts, newspapers and other publications and in television or film releases, slides, videotape, distribution over the internet and picture date storage) which Great Lakes Radio, Inc. may deem appropriate. If a contest accepts telephone entries, Great Lakes Radio, Inc., its affiliate stations (WRPP, WRUP, WQXO, WKQS, WFXD) and sponsors are not responsible for the inability of caller to complete the call during the call-in portion of the contest whether due to telephone equipment malfunctions; disconnections; busy lines; faulty, mistranscribed, misdirected, or misdialed telephone communications; or other circumstances. Only calls to the designated telephone number will be eligible to win. If a contest accepts fax or mail entries (postal or electronic), Great Lakes Radio, Inc. and its sponsors are not responsible for the late, misdirected, lost, misplaced, illegible, mutilated or postage-due entries for any reason, including electronic or computer malfunctions that may affect the delivery or content of the entry, nor are they liable for any injury or damage to entrant’s or any other person’s computer or hardware related to or resulting from participating in or downloading any information necessary to participate in the contest. In the event a contest accepts website entries, participants must accurately complete all required fields or entry will be deemed invalid. Great Lakes Radio, Inc. and its sponsors shall have no liability for any malfunction of the Internet, Great Lakes Radio, Inc. website or any other computer-related processor system. Great Lakes Radio, Inc. is not responsible for any prize offered or any aspect of any contest appearing on an advertiser’s web banner or hyperlink located on Great Lakes Radio, Inc. website. Drop Box and/or Bucket Entries. In the event a contest accepts entry forms by deposit in an entry box or Contest Bucket, Great Lakes Radio, Inc. and its sponsors are not responsible for lost, misplaced, illegible, mutilated, or incomplete entry forms, and such entries will be deemed invalid. Prizes are specified within individual contest rules. Prizes are non-transferable and non-exchangeable. No substitution or cash equivalent will be made. Great Lakes Radio, Inc. reserves the right to substitute a prize of equal or greater value if the awarded prize in unavailable for any reason prior to prize or prize certificate being awarded. If a prize or prize certificate or tickets to a performance are awarded as a prize, Great Lakes Radio, Inc. is not responsible for delivery or lost value for prize awards or for any cancellation or rescheduling of the performance for any reason and has no obligation to reimburse, refund or otherwise substitute the tickets for another prize should the performance not be rescheduled or vouchers not issued or prize certificate not honored. Furthermore, Great Lakes Radio, Inc. is not responsible for cancellations or delays in travel accommodations and has no obligation to reimburse, refund or otherwise substitute any prize, prize certifates, or tickets awarded as a part of a travel prize due to such cancellations or delays. In the event that a prize is mailed to the winner, pursuant to winner’s prior written consent, winner assumes the risk of the prize’s safe arrival. Winners must provide proof of age, photo identification and a valid taxpayer identification number or social security number before any prize will be awarded. The only accepted types of photo identification are government issued photo identifications, including a valid driver’s license or United States passport. Great Lakes Radio, Inc. reserves the right to deny awarding the prize if the winner fails to provide satisfactory identification, as determined in Great Lakes Radio, Inc.’s sole discretion. In addition, winners agree to execute an affidavit of eligibility, indemnification and release of liability before any prize is awarded. If the prize is travel tickets, travel partners, if any, must meet age eligibility requirements and must also execute an affidavit of eligibility, indemnification and release of liability prior to awarding the prize. Failure to execute any of these documents or comply with any of the terms will result in forfeiture of the prize. Winners have thirty (30) days from the date their name is first announced on the air, or by other disclosed mode of public dissemination, to claim and pick up their prize. Failure to claim and pick up prize within this time for any reason will result in forfeiture of the prize. Great Lakes Radio, Inc. reserves the right, in its sole discretion, to award unclaimed prizes to alternate contestants or not to award the unclaimed prizes. All federal, state and local laws and regulations apply. All federal, state and local taxes (including any sales taxes) are the sole responsibility of the winner. Prior to the delivery of any prize, Great Lakes Radio, Inc. reserves the right to collect from the winner any taxes it deems appropriate. Any person winning over 0 in prizes during any one year period will receive an IRS form 1099 at the end of the calendar year, and a copy of such form will be filed with the IRS. Any additional costs relating to the prizes, and incurred as a result of accepting the prizes, is the sole responsibility of the winner. Each prizewinner must supply Great Lakes Radio, Inc. with his/her legal name, mailing address, birth date, and daytime and nighttime telephone numbers. Winner must also supply social security number and, if requested, photo identification (Michigan State Identification Card, Valid Michigan Driver License, Passport). Entries selected for display and to win “best of” contests and any other contests requiring photo, text or other content from the entrants will be judged entirely at the discretion of Great Lakes Radio, Inc.
By submitting any photo or information to Great Lakes Radio, Inc., you hereby grant to Great Lakes Radio, Inc. and its affiliates, subsidiaries, licensees and assigns, an irrevocable, perpetual and royalty-free right to use, reproduce, edit, display, transmit, prepare derivative works of, modify, publish and otherwise make use of the submitted photo or other information in any and all media, whether now known or hereinafter created, throughout the world and for any purpose. In addition, the rights granted to Great Lakes Radio, Inc. includes but is not limited to the right to resize, crop, censor, compress, edit, feature, caption, affix logos to, and to otherwise alter or make use of the submitted photo. By submitting any photo or information to Great Lakes Radio, Inc., you hereby represent and warrant that the submitted photo or information does not and shall not infringe on any copyright, any rights of privacy or publicity of any person, or any other right of any third party, and you have the right to grant any and all rights and licenses granted to Great Lakes Radio, Inc. herein, including but not limited to all necessary rights under copyright, free and clear of any claims or encumbrances. You acknowledge and agree that Great Lakes Radio, Inc. shall have no obligation to post, display or otherwise make publicly available any photo or information submitted by you, and may, in its sole and unfettered discretion, remove, edit, modify or delete any photo or information that you submit to Great Lakes Radio, Inc..
You understand and intend that any photo or information submitted by you to Great Lakes Radio, Inc. may be available for viewing, rating, review and comment on by the public, and understand that comments or ratings with which you disagree or are unhappy about may be published or otherwise become associated with any photo or information you submit to Great Lakes Radio, Inc.. By submitting any photo or information to Great Lakes Radio, Inc., you hereby waive any privacy expectations that you may have with respect to any such photo or information submitted by you to Great Lakes Radio, Inc.
You hereby agree to hold Great Lakes Radio, Inc. and its affiliates, subsidiaries, licensees sponsors and assigns harmless from and against, and hereby waive any right to pursue, any claims of any nature arising in connection with the inclusion in, publication via or display on any Great Lakes Radio, Inc. site, or any other use authorized under these Terms, of any photo or information submitted to Great Lakes Radio, Inc. by you. Photos or information submitted by you to the Site shall be the property of Great Lakes Radio, Inc., and Great Lakes Radio, Inc. shall have no obligation to preserve, return or otherwise make available to you or others any photos or information so submitted. No automated entries are allowed. All entries become the property of Great Lakes Radio, Inc. Entries may be shared with any or all sponsors with the express purpose of allowing sponsors to contact entrants to provide further information about products and/or services that the sponsors have to offer. All entrants may be subscribed to free newsletters and/or periodic or special mailings or emailings offered by the sponsors or by Great Lakes Radio, Inc. By submitting this registration, you agree that you are at least 18 years of age. Violating any of the General Rules or Specific Rules of Contest, or Failing to provide complete and truthful answers to any contest questions voids an entry. Great Lakes Radio, Inc. shall have the right to modify all rules of its contest at any time with or without notice. No non-human entities may participate or win. All contestants unless otherwise indicated in specific rules must be eighteen years of age or older. Winners of ANY Great Lakes Radio, Inc. radio station contests in last 30 days are ineligible. These rules apply to all Great Lakes Radio, Inc. sponsored contests unless modified or superseded by rules written for a specific contest, or if inapplicable for such a promotion or contest. In the event any specific contest rule conflicts with any of the general rules provided above, the specific contest rules prevail. Great Lakes Radio, Inc. reserves the right in its sole discretion to supplement or make changes to the rules of any contest at any time without notice. Great Lakes Radio, Inc. reserves the right in its sole discretion to interpret the rules of any contest, and such interpretation shall be binding upon all participants. Great Lakes Radio, Inc. shall not be responsible for any administrative errors involved in the execution of any contest. Copies of the Official Rules for any contest may also be attained by sending a self-addressed stamped envelope with the identity of the contest inquiry to: Great Lakes Radio, Inc. 3060 U.S. 41 West, Marquette, MI 49855. For a list of contest winners, please go to the a Great Lakes Radio, Inc. websites where the contest had and entry form and click the CONTEST button.